Home Research Faculty Susan Frost, Ph.D.
Dr. Susan C. Frost earned her Ph.D. degree in biochemistry from the University of Arizona in 1979. She was an Adjunct Assistant Professor at Arizona for three years before taking a postdoctoral position in the laboratory of M. Daniel Lane at Johns Hopkins University. Here she studied insulin-dependent glucose transport in adipocytes, funded by NIH. Dr. 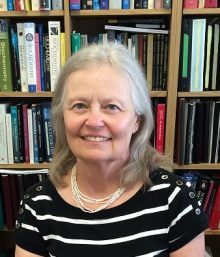 Frost joined the Faculty at the University of Florida in 1985 and is currently a Professor of Biochemistry and Molecular Biology She has served on multiple editorial boards, and recently finished four years of service on the Diabestes and Kidney Diseases B Subcommittee of NIDDK (2009-2013). She chaired the department from 1996 to 1998 and served as the Director of the BMB Ph.D. program from 2007-2010. My laboratory studies the regulation of the microenvironment by carbonic anhydrase (CA) in breast cancer cells. 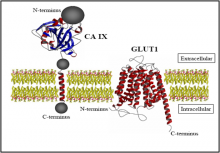 We have known for decades that hypoxic conditions in cancer cells lead to the upregulation of the GLUT1 glucose transporter which increases glycolytic activity and accumulation of lactic acid. The protons generated by the synthesis of lactic acid are exported to the micro- environment where they contribute to acidification. There are two membrane-bound CAs that are associated with breast cancer: Carbonic anhydrase IX (CAIX) and carbonic anhydrase XII (CAXII). CAIX expression is associated with hypoxic regions of breast cancer tumors, metastatic disease, and poor patient prognosis. In contrast, CAXII expression is an indicator of good prognosis, despite catalyzing the same chemical reaction as CAIX. We hypothesize that CAIX is better able to regulate the pH of the microenvironment over that of CAXII which favors cancer cell survival. We are currently testing this hypothesis in cell lines and xenograft tumors.